This high temperature Vortex cooler, HT, with a IP 66 protection degree, is easy to install, has no moving parts, and is maintenance free. 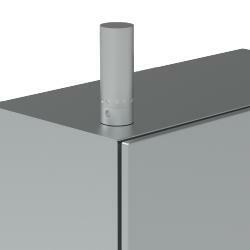 In addition to cooling, it also reduces the relative humidity within the enclosure it is mounted on. This Vortex cooler is an ideal solution to prevent overheating within the enclosure in environments up to 93ºC, for example in a steel mill. Compact and reliable way to cool enclosures. It produces cold air from compressed air, with no moving parts. The easy mounting, through a standard electrical knockout, makes this solution especially suitable to be installed, even when the enclosures are already in the field. For a continuous Vortex operating, relative humidity inside the enclosure is maintained at aproximately 45%, no moisture condenses inside the enclosure (the enclosure must be sealed). Suitable even for ambient temperatures up to 93 °C, the internal components can withstand these high temperatures, and includes a silencer to minimize the noise. The coolers must be installed vertically to maintain the protection degree. Internal vortex tube manufactured in stainless steel. External cover, BP TYPE 12 in plastic and aluminium, BP TYPE 4 in aluminium, and TYPE 4X in stainless steel. Depending on type, up to IP 66 | TYPE 4X. Vortex cooler with mounting accessories. The vortex cooler provides a maintenance free cooling solution which also reduces the relative humidity within the enclosure. The vortex cooler can be installed on the enclosure easily, in environments of up to 93ºC, reducing the required installation time. The maintenance free cooling solution prevents unnecessary downtime. This reliable solution reduces the customer's labour cost due to the ease of installation. The vortex cooler will be a good thermal management solution for high temperature environments such as a steel mill. It is recommended to install a thermostat, BPT, as well as an air distribution kit, BPA.